SR 165 branches north from Interstate 5 at a rural exchange (Exit 391) in southern Merced County. Photo taken 07/12/18. California State Route 165 connects Interstate 5 south of Los Banos with California 99 in Turlock. The rural highway bee lines north across agricultural areas of the Central Valley to Los Banos, Great Valley Grasslands State Park, Stevinson and Hilmar. California 165 reassurance marker posted between I-5 (Westside Highway) and Pole Line Road. Photo taken 2002. Transitioning into the urban area of Turlock, the daytime headlight requirement along SR 165 (Lander Avenue) northbound ends. Photo taken 07/10/18. Northbound SR 165 (Lander Avenue) enters the Turlock city limits at Simmons Road. Photo taken 07/10/18. SR 165 north ends at a diamond interchange with SR 99, 1.25 miles south of the Turlock city center. Photo taken 07/10/18. SR 99 bypasses Turlock to the west between Delhi and Keyes. Photos taken 07/10/18. SR 99 ventures north from SR 165 in Turlock to Modesto, Stockton and Sacramento. Photos taken 07/10/18. Lander Avenue leads south from Downtown Turlock to meet SR 99 at the north end of SR 165. Photo taken 07/10/18. Leaving the city of Turlock, SR 165 (Lander Avenue) transitions into a rural highway, with a daylight headlight section commencing south of Simmons Road. Photo taken 07/10/18. The first confirming marker for SR 165 south accompanies a mileage sign posted four miles from the unincorporated community of Hilmar. Photo taken 07/10/18. SR 165 confirming marker posted south of SR 33/125 (Pacheco Boulevard) in Los Banos. Photo taken 07/12/18. Merced County milepost 8.50 for SR 165 stands just south of SR 33/152 in Los Banos. Photo taken 07/12/18. A HAWK signal operates at SR 165 and Scripps Drive east for an adjacent elementary school. Photo taken 07/12/18. Pioneer Road stems west from SR 165 along suburban areas on the south side of Los Banos. Photo taken 07/12/18. SR 165 is a safety corridor leading across agricultural areas south of Los Banos. Photo taken 07/12/18. A 1949-built bridge spans Main Canal along SR 165. Photo taken 07/12/18. Reassurance marker posted south of Copa De Oro Avenue. Photo taken 07/12/18. SR 165 (Mercey Springs Road) south at Cotton Road east. Photo taken 07/12/18. Semi trucks appear along Interstate 5 ahead of the Diablo Range foot hills to the southwest. Photo taken 07/12/18. Crossing Outside Canal on SR 165 south. Photo taken 07/12/18. California 165 shield posted after the intersection with Charleston Road. Photo taken 07/12/18. California 165 (Mercey Springs Road) south at Delta Mendota Canal. Photo taken 07/12/18. SR 165 and Interstate 5 converge 3.3 miles south of Delta-Mendota Canal. Photo taken 07/12/18. 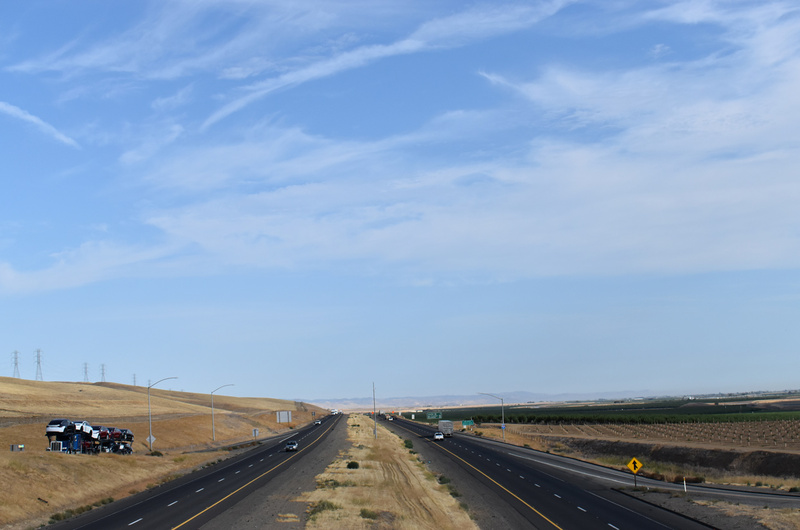 The California Aqueduct parallels I-5 along the west side of the San Joaquin Valley. Photo taken 07/12/18. Pole Line Road branches southeast from SR 165 to Nees Avenue. Photo taken 07/12/18. State Route 165 concludes at a diamond interchange with Interstate 5. Photos taken 07/12/18. I-5 (Westside Highway) runs along the east side of the Diablo Range toward Tracy. Photo taken 07/12/18. The SR 165 roadway ends at the southbound entrance ramp for I-5 to Los Angeles. Photos taken 07/12/18.